Who doesnt shop online these days? Since Ive been home recovering from my gallbladder surgery, Ive done even more online shopping! I mean it could get dangerous if I dont heal soon! Im always looking for new pet products for Chuy but I dont like overspending! Youre with me on that, right? I tend to do a lot of comparison shopping before I buy because I like knowing I got the lowest possible price. Its actually an adrenalin rush when I find an irresistible deal. Yea, I need to get out more lol. 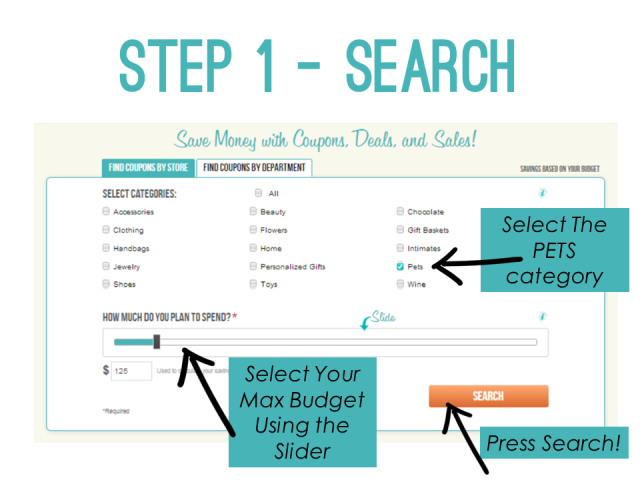 I was recently introduced to an amazing new online coupon tool called Chippmunk. They are a one stop shop to find the best deals based on your budget. Enough of my rambling, let me teach you how to use Chippmunk. 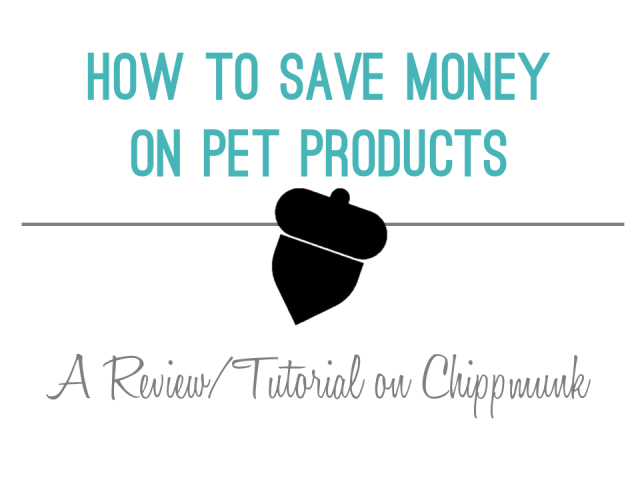 Its really that easy to start saving money with Chippmunk! Want to try it out on your own? 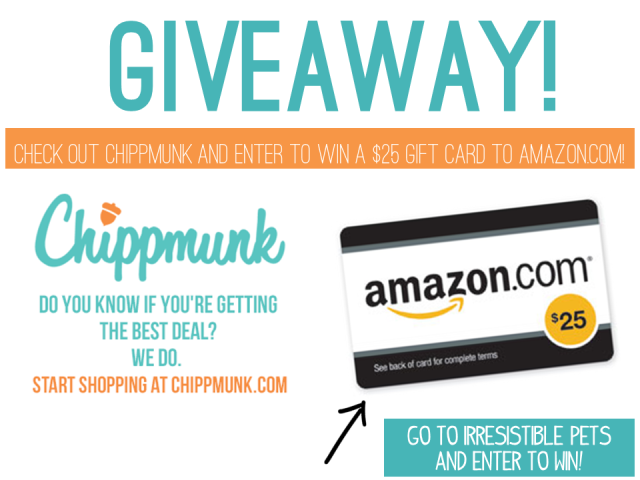 Well its your lucky day because Chippmunk has teamed up with Irresistible Pets to giveaway a $25 Amazon Gift Card! Win a $25 Amazon Gift Card from Chippmunk! To be eligible to win, you MUST enter with the Rafflecopter widget below. The requirement is that you do a search on Chippmunk and leave a comment on this post telling us which pet coupon you this is irresistible and why. There are several opportunities for bonus entries too! Please follow the instructions in the Rafflecopter widget! This giveaway ends on Friday, April 12th, 2013 at 11:59pm EST. TEST – I think the Bark Box coupon is irresistible. 37% off a 6 month plan! I like the doggiefood.com coupon free shipping on $50! 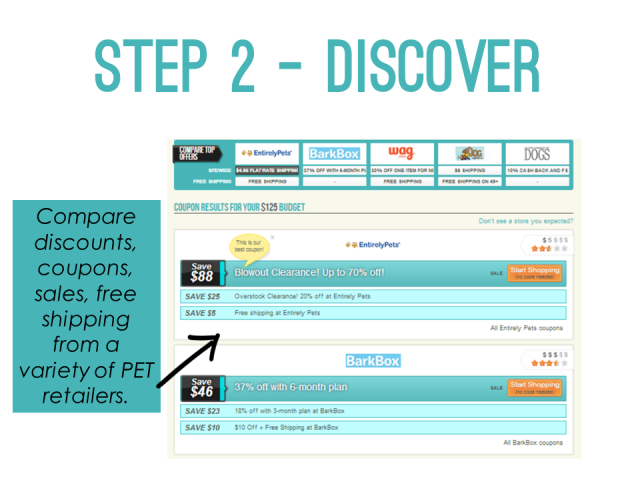 The coupon for $3 off a $10 at Petsmart is irresistible! 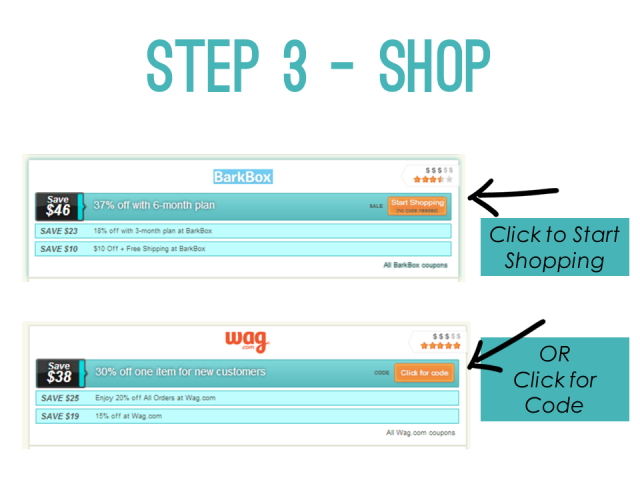 I like the 30% off for new customers at Wag.com coupon! I loved the petsmart coupons! Simply irresistable! Great coupon – Entirely pets Checkered Nylon Adjustable Collars. 15% off at Steve Madden! Oh I would love the 7 off 70 at Petco! I need more dogfood! I love the $3 off $10 at Petsmart. the deal on the barkbox is awesome! The “15 to 40% off” coupon is the most irresistible one. Free Shipping at Pet Mountain. Set my budget at $101, just to see what would happen. The top deal is from Petco, which is where I get my food anyway! I liked the coupon to save up to 50% on Petco! I like several, a good one is the $3 off $10 @ petsmart. I like $32 off Glossy Box! Petco has a great coupon or 50% off sitewide. Thanks! I like the petsmart coupons. Save 50% off statewide at Petco is very nice! Great system and site! I will be using this a lot! Thanks for the chance. I see 25% off of Old Navy! I can hardly pass that up! If I spend $100, that’s $25 off plus free shipping! Loving it! 60% off at Urban Outfitters! I really liked the coupon for Petco for 50% off storewide. Thanks for the great giveaway! $3 off of $10 at Petsmart!